Wetlands have been widely regarded as providing important natural ecosystem functions, such as flood control, water purification and habitat for wildlife and aquatic organisms. Recognition of these benefits has prompted scientists to construct and engineer wetlands to optimize wetland functions of relevance to the treatment of stormwater and wastewater. 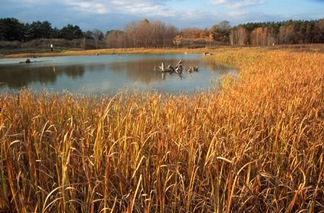 Constructed wetlands are generally classified as surface or subsurface flow. Surface flow wetlands usually have a shallow permanent pool that supports the growth of emergent wetland plants, such as cattails and bulrushes. In subsurface flow wetlands, treatment occurs entirely below the surface, usually within a gravel bed planted with emergent wetland plants. The choice of wetland depends on several factors, including flow rate and the nature of pollutants to be treated. Over the past 15 years, constructed wetlands have become one of the most common practices employed for stormwater control in Ontario. The vast majority of these are surface flow wetlands, with similar objectives to stormwater ponds. Constructed wetlands for wastewater treatment are not as common, but several examples exist in Ontario. There has been some public concern about siting constructed wetlands near residential areas due to possibility for undesirable odours associated with algal decomposition and an increase in mosquito populations. These concerns may be addressed by ensuring continuous recirculation of water, keeping stormwater detention times to the minimum required, and creating a well-balanced ecosystem. Maintenance and performance checks should be conducted on an ongoing basis following construction in order to determine when dredging or harvesting is needed and to ensure that the ecosystem remains balanced.